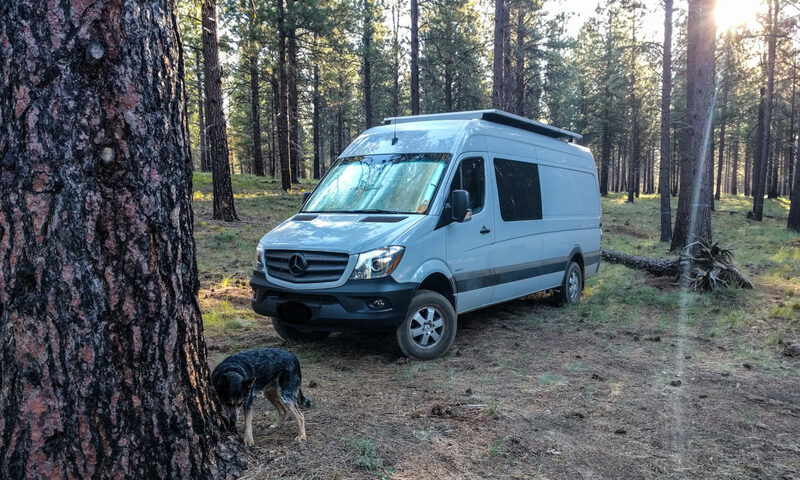 We’ve already written about how flimsy the Sprinter’s antenna (aerial) is. We’ve repaired ours before after snapping off part of the housing when we caught the mast on something. This time, we needed to remove the antenna from the roof to really glue it back together properly. 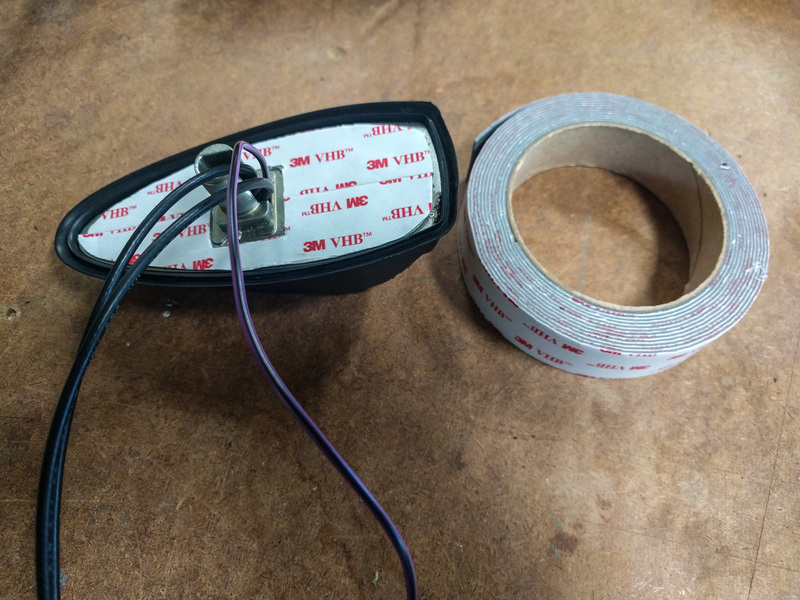 Here’s how we did it, and some other options if you can’t make the repair work. 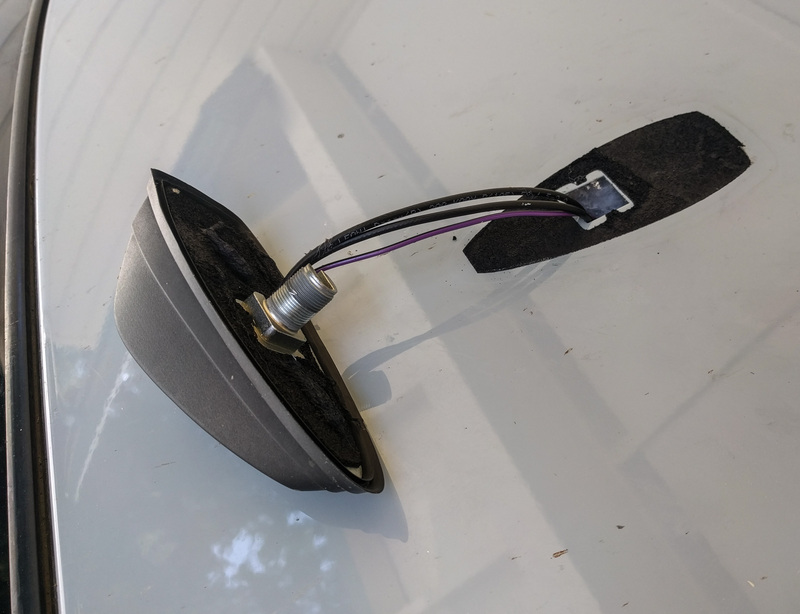 We already wrote a how-to article about repairing the easily-broken area on the Sprinter antenna where the removable whip part screws into the plastic base. Our antenna had a run-in with some low hanging trees and it broke off again in the same location. We decided to take it off the roof to make it easier to fix. The first thing you need to know is, you might not need to remove the headliner in order to get to the back of the antenna. So long as your van has some kind of overhead console, it’s likely you can reach up through it to get to the antenna bolt. First, remove the console from the headliner. On ours, there are two metal clips on the passenger (right) side of the plastic console. Pushing them in with a trim tool lets the whole console drop down, then you can unhook it from the driver’s side too. The passenger side of the courtesy light cluster has two metal spring clips. The driver’s side has two plastic tabs. Push the spring clips in and hinge the unit down to remove it. You may have to remove some other pieces of plastic if you have the overhead cubby too. You’re aiming to get access to the inside of the roof where the antenna attaches. We took out the rails inside the cubby, and that gave us the room we needed. The antenna fixing bolt as seen through the overhead cubby. A 22mm nut holds it in place. Now you just have to unclip the wires going to the antenna. 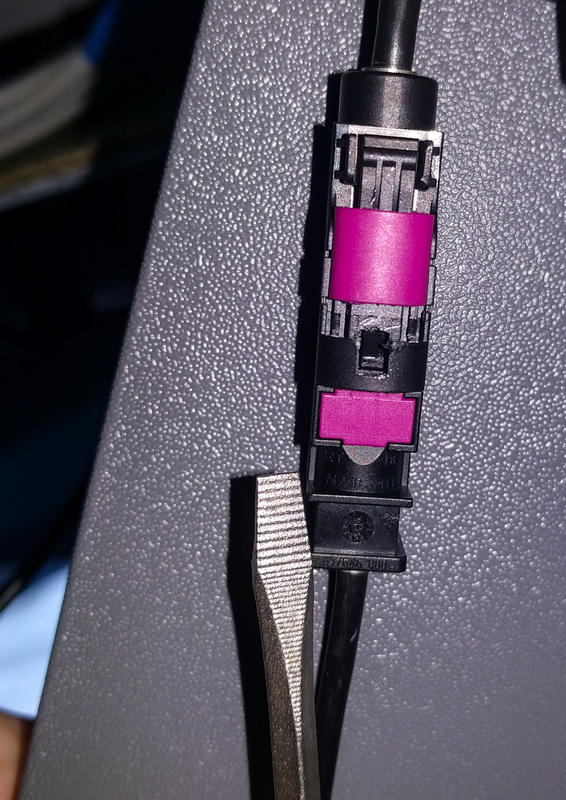 There will be one 12v spade terminal and either one or two FAKRA connectors for FM (black) and GPS (purple) if you have a factory navigation unit installed. FAKRA connectors look complex, but there’s one small tab holding the two halves together. You just have to insert a screwdriver to squeeze the end of the tab towards the body of the connector and the two halves will release. After you’ve got the wires loose, you can undo the 22mm nut. The antenna won’t fall off the roof because it’s glued down with double sided foam adhesive stuff. Now it’s time to get on a step ladder and precariously reach over to free up the antenna unit. We found that dental floss does a pretty good job because you can slide it under the seal around the edge of the plastic. If you have a plastic scraper, that might work too. Obviously using a metal blade makes it very likely you’ll damage the paint. Here’s the shape of the adhesive you’ll need to remove. The antenna after the nut is removed from its fixing bolt – you’ll have to work a blade or string under the base to remove all the black sticky stuff. Once the antenna is free from the sticky goop, you can remove it from the vehicle. The rest of the goop cleans up OK with a plastic scraper (we used one of our trim tools) and a final application of goof-off. Scrape off the remaining sticky gunk with a plastic tool. Now it’s time to see how much damage really got done to your antenna unit. If you scrape off the goop from the bottom of the antenna, you’ll see five T9 Torx screws holding the base to the plastic top part. Undo those, and the plastic part pops off. Our antenna showed signs of water damage, but it still functioned OK. More worrying was that in the previous repair we did, we got some glue on the spring contact on the circuit board that presses against the base of the antenna-holding nut in the plastic cover. That might have been one reason why the reception wasn’t so good! We scraped some of the glue off the plastic surround and cleaned it up well enough to make a good contact. Then we used the same glue as before – Loctite’s Epoxy Plastic Bonder. This stuff seems to stick really well to the type of plastic used for the antenna cover. Because we had the antenna off the vehicle we could be more accurate in our gluing technique. We also poured extra glue around the inside of the cover to reinforce the whole area where the antenna screws in. After the glue had set up, we reassembled the unit and stuck some VHB tape on the base. This isn’t quite the same stuff as the original adhesive, but in combination with the rubber lip around the edge of the antenna it should do well enough to keep the water out. Get back up on your ladder, feed the wires down through the roof hole, then thread the antenna fixing bolt back in place. Give the antenna a good push to seat the VHB tape, and then attach the nut from the inside. Remember to re-attach the antenna wires before you put everything else back in place. Buying a new Sprinter antenna – with or without GPS? 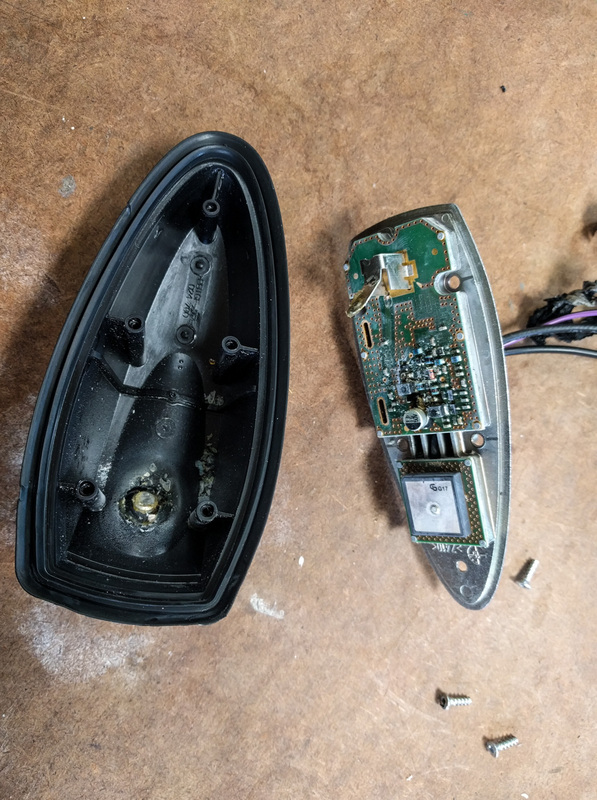 If you find that your antenna is too water damaged to work any more, or if you snapped the plastic in a place where it’s too hard to repair, then you’ll probably need to buy a new one. The NCV3 antennae are model-specific. 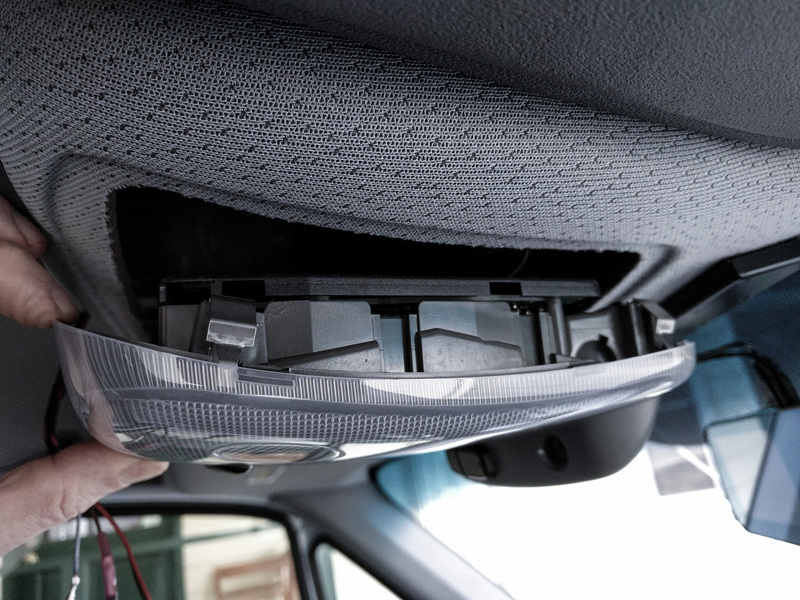 For instance, if your vehicle has a built-in navigation system then you’ll have an antenna with a GPS receiver in it. The best way to make sure you get the correct model is to look at the part number on a label stuck to one of the cables on your existing antenna. Fed up? What about a different antenna? After you’ve broken a couple of antennae, you might be wondering what you can do to stop this from happening so often. One answer is to use a shorter mast/whip. You can buy “stubby” masts or shorter “Fuba” style ones than the 14″ one that comes as stock. The issue there is that you might not get such good reception with a shorter mast. There are other antenna options too. Pretty much any amplified antenna with a FAKRA connector and a +12v input should work (ignoring the GPS for a second). Shark fin units designed for other Mercedes vehicles or even Audi units should work fine, and often they even come with the same mounting bolt. Again, don’t expect the same level of reception with a shark fin unit because often it’ll be shielded from the radio waves by the sheer bulk of the van. You’ll notice we emphasized the word “should” above. we haven’t tried installing a shark fin antenna yet, but it’s our next step if/when we break ours again. Thanks for the info. on antennas. I recently had a run in with snow and the load ripped ours off too. At the top of this page it looks like a shark fin antenna on a sprinter. Did you end up upgrading? If so which one did you go with? Thank you!! 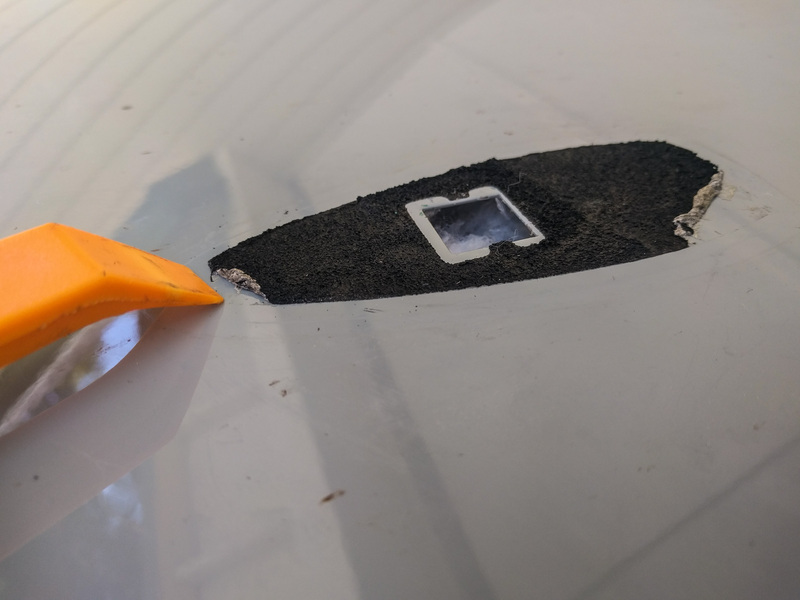 Gabe, we experimented with a dirt cheap plastic shark fin cover with a flat antenna that was supposed to screw into the same hole as the antenna whip, but the one we bought didn’t fit properly over the OEM antenna base. We haven’t found a good alternative to the OEM antenna yet. It's easy to say thanks. Buying products we link to gives us an Amazon commission at no cost to you. Want a true 4WD Sprinter with locking diffs? Iglhaut Allrad is coming to the USA.